Perry Edward Heydon married Rose Catherine Donahue. Married Name Her married name was Heydon. Rose Catherine Donahue married Perry Edward Heydon. Ray Heydon was the son of Perry Edward Heydon and Rose Catherine Donahue. Ray Heydon died at died in infancy. Married Name circa 1853 As of circa 1853,her married name was Wells. Jane L.F. Douglass was born on 21 December 1829 at Decatur, Indiana. She married Simpson Tanner Wells, son of John Haston Wells and Achsah Jane Tanner, circa 1853. Jane L.F. Douglass died on 25 November 1903 at Major, Oklahoma, at age 73. Jacob L. Wells was born on 3 February 1854 at Decatur, Indiana. He was the son of Simpson Tanner Wells and Jane L.F. Douglass. Jacob L. Wells died in 1921 at Major, Oklahoma. Ravanah Wells was born on 7 March 1856 at Decatur, Indiana. She was the daughter of Simpson Tanner Wells and Jane L.F. Douglass. Ravanah Wells died on 2 February 1942 at Major, Oklahoma, at age 85. Name Variation circa 1886 As of circa 1886, Junius Elmer Wells was also known as June E.
Junius Elmer Wells was born on 1 June 1858 at Benton, Iowa. Junius Elmer Wells married Ida Elizabeth Billings circa 1886. Junius Elmer Wells died on 7 December 1928 at Major, Oklahoma, at age 70. [S245] U.S. Federal Census 1900 U.S. Federal Census, by Ancestry.com, Year: 1900; Census Place: Deep Creek, Woods, Oklahoma; Roll: 1343; Page: 2A; Enumeration District: 0221; FHL microfilm: 1241343. Ida Elizabeth Billings was born on 23 April 1866 at Pennsylvania. She married Junius Elmer Wells, son of Simpson Tanner Wells and Jane L.F. Douglass, circa 1886. Ida Elizabeth Billings died on 24 October 1932 at Major, Oklahoma, at age 66. Ida Elizabeth Billings had 5 with 3 living in 1900 children. Emma Alice Wells married Christopher W. Long. Emma Alice Wells was born on 29 June 1860 at Iowa. Emma Alice Wells died on 1 January 1946 at Major, Oklahoma, at age 85. Christopher W. Long married Emma Alice Wells, daughter of Simpson Tanner Wells and Jane L.F. Douglass. Christopher W. Long was born on 11 January 1860 at Kansas. He died on 4 March 1940 at Oklahoma at age 80. Married Name Her married name was Horton. Name Variation Achsah Jane Wells was also known as Jennie. Achsah Jane Wells married Charles H. Horton. Achsah Jane Wells was born on 23 March 1862 at Iowa. Achsah Jane Wells died on 13 November 1937 at Major, Oklahoma, at age 75. Charles H. Horton married Achsah Jane Wells, daughter of Simpson Tanner Wells and Jane L.F. Douglass. Charles H. Horton was born in 1863. John David Wells married Lula A. Walters. John David Wells was born on 20 September 1866 at Iowa. John David Wells died on 15 January 1944 at Major, Oklahoma, at age 77. Lula A. Walters married John David Wells, son of Simpson Tanner Wells and Jane L.F. Douglass. Lula A. Walters was born on 14 October 1876 at Illinois. She died in 1940 at Major, Oklahoma. Charles Cevy Wells married Alice Clements. Charles Cevy Wells was born on 5 October 1871 at Iowa. Charles Cevy Wells died on 6 February 1947 at Major, Oklahoma, at age 75. Name Variation Alice Clements was also known as Allie. Alice Clements married Charles Cevy Wells, son of Simpson Tanner Wells and Jane L.F. Douglass. Alice Clements was born on 20 February 1880 at Kansas. She died on 9 February 1937 at Major, Oklahoma, at age 56. Roy L. Wells was born in October 1888 at Kansas. He was the son of Junius Elmer Wells and Ida Elizabeth Billings. Pearlie Wells was born in August 1891 at Kansas. Nina A. Wells was born in April 1899 at Oklahoma. She was the daughter of Junius Elmer Wells and Ida Elizabeth Billings. John T. Mozingo was born in April 1870 at Iowa also reported as Apr 1871. He was the son of James Harvey Mozingo and Nancy Wells. [S247] U.S. Federal Census 1870 U.S. Federal Census, by Ancestry.com, Year: 1870; Census Place: Grove, Davis, Iowa; Roll: M593_386; Page: 81A; Image: 167; Family History Library Film: 545885. [S245] U.S. Federal Census 1900 U.S. Federal Census, by Ancestry.com, Year: 1900; Census Place: Wilson, Adair, Missouri; Roll: 836; Page: 2B; Enumeration District: 0017; FHL microfilm: 1240836. Elisabeth E. Mozingo was born circa 1865 at Iowa. She was the daughter of James Harvey Mozingo and Nancy Wells. Ulyssus S. Mozingo was born circa 1868 at Iowa. Name Variation William H. Mozingo was also known as W. H.
William H. Mozingo was born on 31 January 1846 at Indiana. He was the son of Thornton Thomas Mozingo and Minervia Collier. William H. Mozingo died on 8 November 1893 at Scotland, Missouri, at age 47. He married Minnie Allbright on 5 March 1896 at Davis, Iowa. Married Name 5 March 1896 As of 5 March 1896,her married name was Mozingo. Minnie Allbright married William H. Mozingo, son of Thornton Thomas Mozingo and Minervia Collier, on 5 March 1896 at Davis, Iowa. Name Variation Isabella Miller was also known as Belle. Name Variation Isabella Miller was also known as Elizabeth. Married Name before 1881 As of before 1881,her married name was Mozingo. Married Name after 1898 As of after 1898,her married name was Armintrout. Isabella Miller was born circa 1860 at Ohio. She married Elmer Jared Mozingo, son of James Harvey Mozingo and Nancy Wells, before 1881. Isabella Miller married William M. Armintrout after 1898. 1885 Grove, Davis, Iowa Isabella Miller appeared on the census of 1885 in the household of Elmer Jared Mozingo at Grove, Davis, Iowa; living next door to Grandmother Achsah Wells. Name Variation Harriett Mozingo was also known as Phana Delpha. Harriett Mozingo was born on 2 April 1881 at Davis, Iowa. She was the daughter of Elmer Jared Mozingo and Isabella Miller. Harriett Mozingo died on 24 November 1893 at age 12. 1885 Grove, Davis, Iowa Harriett Mozingo appeared on the census of 1885 in the household of Elmer Jared Mozingo at Grove, Davis, Iowa; living next door to Grandmother Achsah Wells. Name Variation John L. Mozingo was also known as J. L.
John L. Mozingo was born on 28 December 1883 at Grove, Davis, Iowa. He was the son of Elmer Jared Mozingo and Isabella Miller. 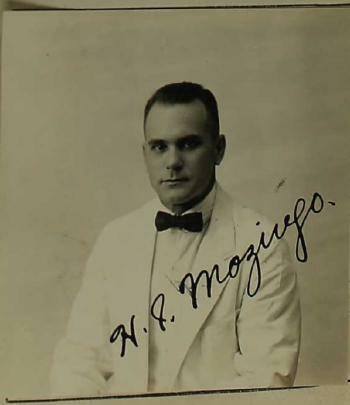 John L. Mozingo died in 1965. 1885 Grove, Davis, Iowa John L. Mozingo appeared on the census of 1885 in the household of Elmer Jared Mozingo at Grove, Davis, Iowa; living next door to Grandmother Achsah Wells. Name Variation Harley I. Mozingo was also known as H. J. Name Variation Harley I. Mozingo was also known as H. I.
Harley I. Mozingo was born on 10 May 1887 at Grove, Davis, Iowa. Harley I. Mozingo died in 1957. Harley I. Mozingo lived in 1923 at Manila, Philippine Islands. On 12 April 1923 at U. S. passport application, Manila, Philippine Islands, going to Hong Kong, China and Japan for vacation; sailing aboard the President Jackson vessel on 12 April 1923. William M. Armintrout was born on 5 June 1859 at Ohio. He married Isabella Miller after 1898. William M. Armintrout died on 8 November 1929 at Iowa at age 70. Nona Ethel Mozingo was born on 27 January 1885. Nona Ethel Mozingo died on 15 February 1885.